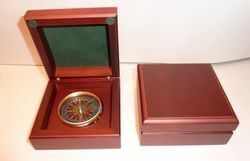 The Compass Company offers this small desk with optional custom engraved plate as a nicely finished, hinged wooden box. This compact desk compass will make a terrific gift - for those friends and loved ones you would never want to see get lost! Add an optional personal inscription to this small wooden compass. The plate will be engraved and placed on the front face of the compass.TYPE your inscription in the box above (25 characters per line) and your request and charge will be added to the order automatically.